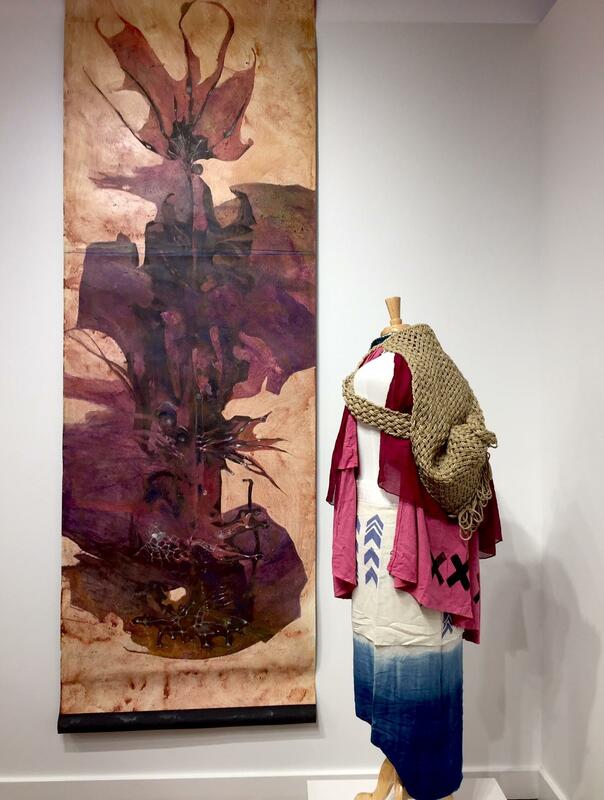 (l-r) Paintings and drawings by Solomon Enos and wearable art by Marques Hanalei Marzan challenge viewers in the new show, "REBOOT: Fashion Futures" at the Ala Moana Fashion Annex through October 25, 2016. A collaboration with the Hawai'i Fashion Incubator, admission is free, and artist contacts are available for inquiries. (l) Painting by Solomon Enos and wearable art by Marques Marzan. The clothing pieces are made of natural fibers and dyes. 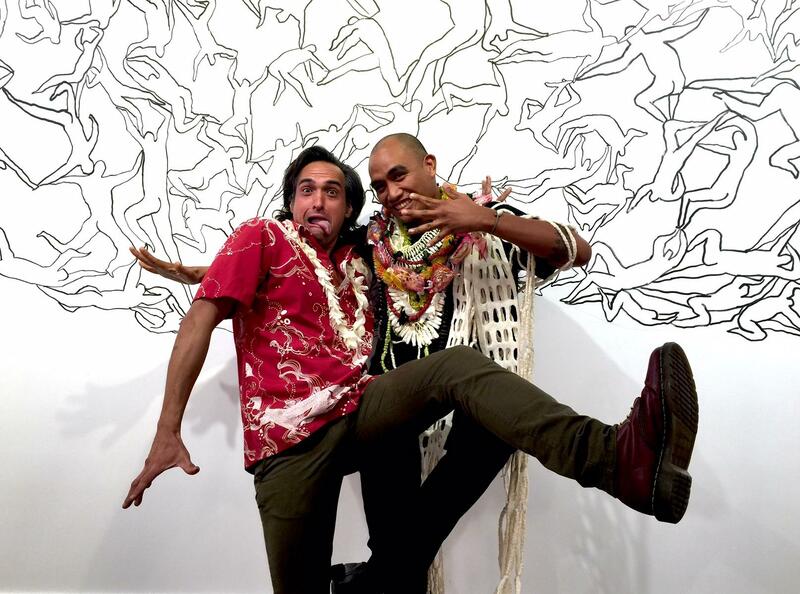 Quick chats with Solomon Enos and Marques Hanalei Marzan about their current show at the new Ala Moana Center Fashion Annex through October 25, 2016. Images relating to Solomon Enos' Polyfantastica project, a Pacific journey of the imagination. Enos depicts figures from different eras, two thousand BCE or seven thousand AD, re-imagining our lives and the accoutrements we will require. “REBOOT: Fashion Futures“ with Solomon Enos and Marques Marzan continues through October 25th ,2016, at Ala Moana Center’s Fashion Annex, located on the mall level, mauka wing. Artist Solomon Enos says clothing is about a lot more than fashion. 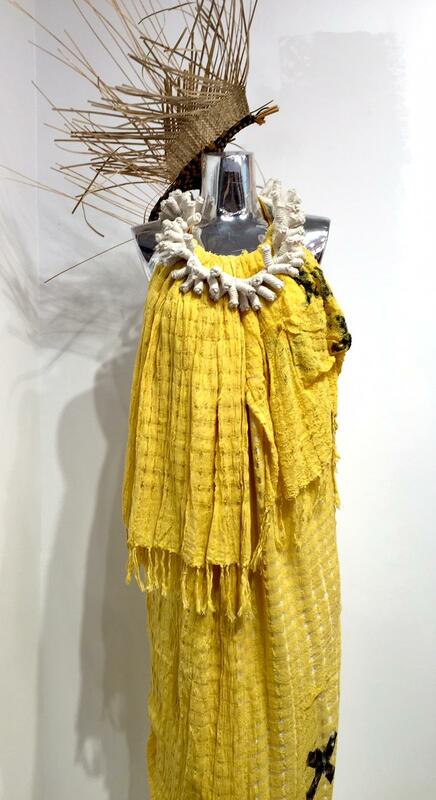 Natural fibers and natural dyes are used extensively in Marzan's pieces, many of which are taken from his collections prepared for the Maoli Arts Month Wearable Art Show over the last eight years. Staging and presentation here, by Ara Feducia. 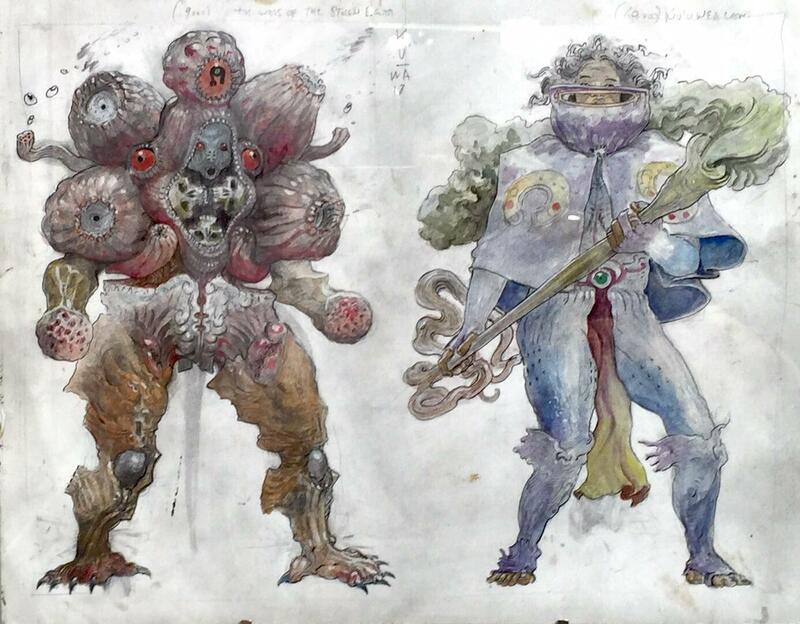 Enos’ paintings and drawings here depict beings from the past, present and future in highly functional attire. Visually striking, Enos is trying to say more. Marques Hanalei Marzan is a cultural resource specialist at the Bishop Museum. 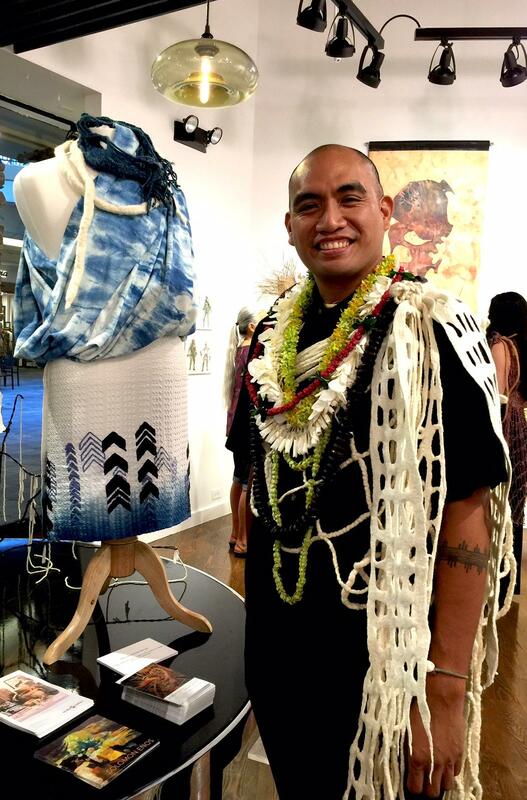 He applies a comprehensive knowledge of Hawaiian customs and textiles to contemporary fashion. Concept, materials and production are aligned, for example in netting, where a single cord is knotted to form an interconnected series of shapes. Marzan believes all those connections can be made through clothing, and he looks like a perfect example of that himself. At the opening of the "REBOOT: Fashion Futures" show, Marques Marzan wore a kihei of felt work and cordage. Marzan is wearing a black collared shirt and black slacks, with a kīhei, or upper body cloak. This kihei involves cream colored felt in an open weave pattern, tied at his left shoulder and falling to his knees. A soft knotted cord in a fishnet pattern sweeps across his body. This is contemporary Hawai‘i. Marzan has participated in the last eight Maoli Arts Month Wearable Art Shows, and pieces from those shows are presented here in fresh combinations by Ara Feducia. The works have progressed through themes over the years, for example, one year the idea of digging deep, exposing one's guts or na'au, led to pieces actually made of dried intestines. Materials, methods and process are consistent with concepts. Felting, for example is the process of combining and fusing varied materials into one pliant whole. Cord work, the act of wrapping and securing also feels like it has community implications. 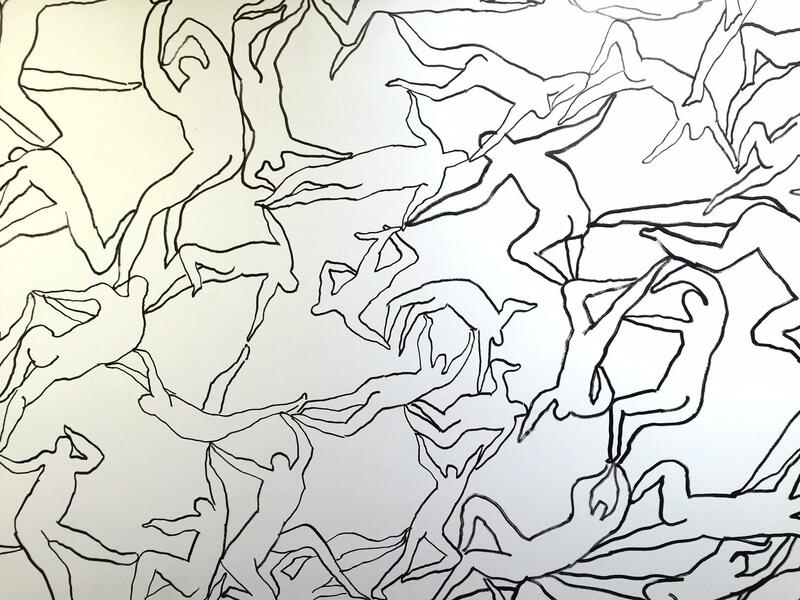 Enos has also festooned the space with Keith Haring style figures, they tumble and link, leap and join up. There’s courage… and fun here. Enos says it’s not about copying products and images of the past. Solomon Enos populated the walls of the gallery with figures, falling, cavorting, grasping hands. They link elements of the show together with a sense of joyful exploration. 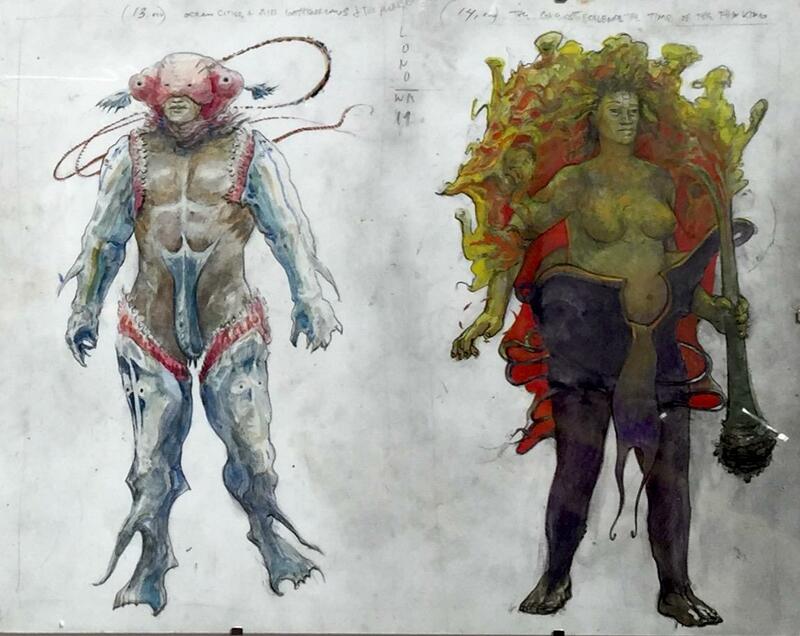 Beings from past, present and future in Solomon Enos' Polyfantastica series. Harajuku, on the western side of metropolitan Tokyo, has been a base for Americans and other expats since World War II. Trendy Japanese flocked there, especially after the ’64 Olympics highlighted Harajuku’s unique style. 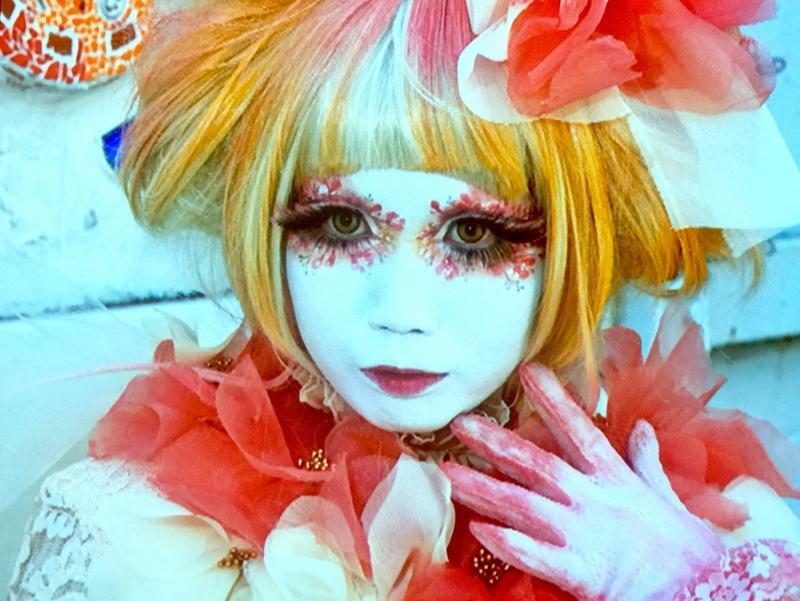 HPR’s Noe Tanigawa reports that for the last 20 years, fashion trends in Harajuku have enjoyed growing influence worldwide, and we can see them now at the Honolulu Museum. This year, the models on the runway at New York Fashion Week look downright comfortable — and Deborah Needleman, editor in chief of T: The New York Times Style Magazine, says that's "good news for real people." In the semi-annual event, fashion editors and store buyers attend elaborate runway shows staged in tents at Lincoln Center and other locations around New York City. 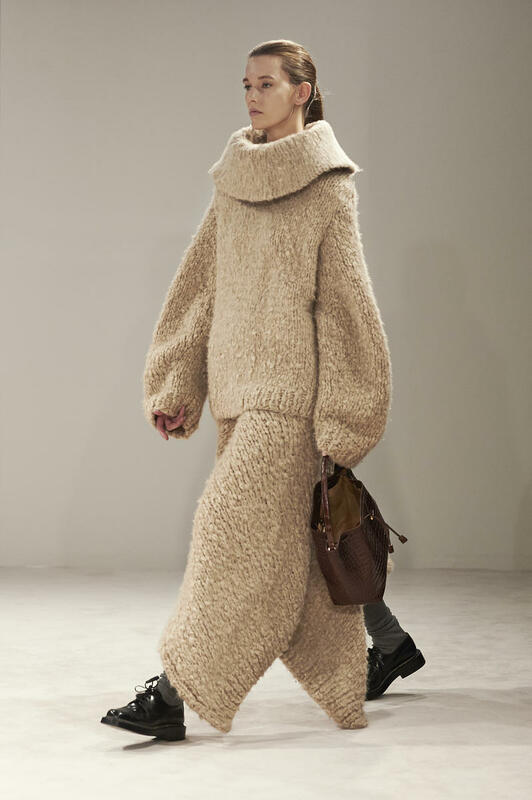 Designers present clothes to them that consumers may see in stores in the fall. First Fridays created a scene for arts and partners in Honolulu’s Chinatown. Now the area’s shops and galleries want to do the same thing for families on Second Saturdays. This Saturday, The Fuzz will conduct valentine crochet fun at the Hawai‘i State Art Museum, and a craft fair will unfold at Next Door Lounge. HPR’s Noe Tanigawa found there’s a lot more going on too. Artist, art educator, Su Atta, has been combining counseling and artmaking for over 30 years. She says skills carry over into life.